Vaulting is a team or individual sport where gymnastic and/or dance moves are performed on the back of a moving horse. Combined with musical routines, Vaulting is a majestic sport that provides vaulters with trust and courage in their own abilities and that of others. 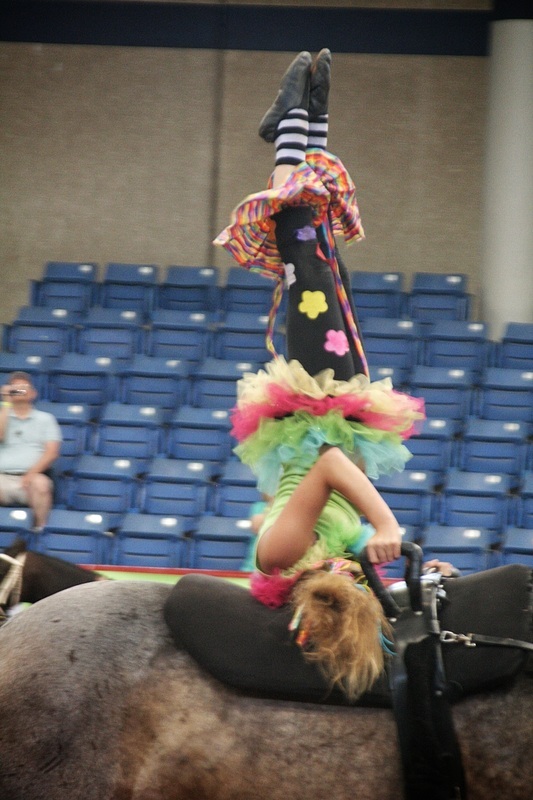 Many times, multiple vaulters are performing on the horse at the same time, and up to three can be on a horse in competition. Vaulters work together to create a beautiful routine performed while the horse is either walking, trotting, or cantering. Vaulters mount and dismount the horse while it is moving on a longe line controlled by an experienced lounger. The Gold Star Pacesetters are an Equestrian Vaulting team located in Burleson, Texas, under the direction of Frank Pace. Children and adults of all ages are invited to join the team. Our team is made up of children as young as 6, up to adults in their mid-30's, and all ages in between. Come join us for a free session! For additional information, please call (817) 975-8916 or contact us.